Discovered in 1879 and 300 to 500 times sweeter than table sugar, saccharin is added to some foods to reduce the calorie count without stripping the food of its sweet flavor. Though there is some controversy about the use of artificial sweeteners and health, saccharin is recognized as safe by the U.S. Food and Drug Administration. Certain diet and low-calorie foods contain saccharin, and they include the artificial sweetener in the ingredient list. 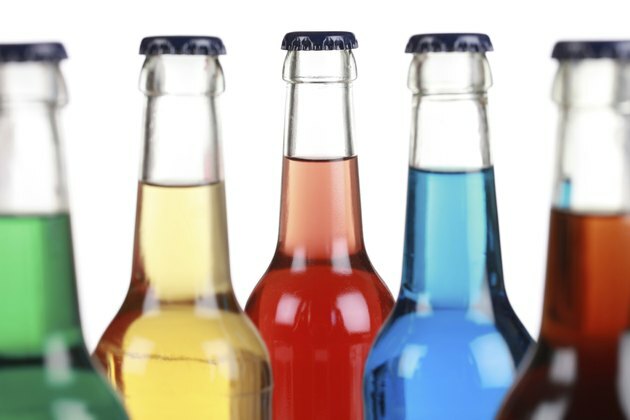 A soda or artificially sweetened beverage can contain saccharin as long as it doesn't exceed 12 milligrams per fluid ounce of a drink, according to the FDA. Saccharin is added to certain diet sodas and other sweet beverages, such as fruit juices labeled as "light." Some powdered drink mixes labeled as "diet" or "sugar-free" also contain saccharin. Because a regular soda can have up to 10 teaspoons of sugar, opting for diet drinks can help women stay with the daily 6-teaspoon limit and men stay within the daily 9-teaspoon limit of sugar, as recommended by the American Heart Association. Fountain Diet Coca-Cola contains a mixture of aspartame and saccharin, and in 2004, the state of Missouri filed a class action suit against The Coca-Cola Company, claiming that The Coca-Cola Company had not stated that its fountain Diet Coke contained saccharin, in addition to aspartame. Store-bought Diet Coke and Coca-Cola Zero do not contain saccharin, and use aspartame exclusively as their sweeteners. In 2008, the Missouri Supreme court rejected the lower court's suit against The Coca-Cola Company because the amount of saccharin in fountain Diet Coke does not exceed 12 milligrams per fluid ounce. A few other states had also filed similar claims against The Coca-Cola Company about its products that contain saccharin, but The Coca Cola Company prevailed in those claims, as well. The Coca-Cola Company's diet soda Tab also contains a minimal amount of saccharin. In 2000, saccharin was delisted from a list of cancer-causing agents. The limit on saccharin in sugar substitutes is 20 milligrams per teaspoon, according to the FDA. Sugar substitutes that contain saccharin include Sweet 'N Low, Sweet Twin and Necta Sweet. These sugar substitutes are commonly added to coffee and tea in place of sugar or used in baked goods instead of granulated sugar, though you'll use less because saccharin is so much sweeter than sugar. A processed food can contain no more than 30 milligrams of saccharin per serving size, according to the FDA. Certain food products labeled as diet contain saccharin to retain the sweetness. For example, canned fruit canned in "light" syrup can contain the artificial sweetener, according to FamilyDoctor.org. Low-calorie or diet baked goods can also contain saccharin, as can sugar-free chewing gum. Several other foods labeled as "low-calorie" or "diet" can contain saccharin, and reading labels is the best way to determine which ones do. For example, low-calorie jams or jellies might contain saccharin to cut the calorie content. Low-calorie candies and dessert toppings, such as flavored syrups for ice cream, can also contain saccharin. Salad dressings labeled as light can also be made with saccharin.